The weatherboards are on - our tiny house is all boxed in! After weeks of putting on weatherboards and delays caused by heavy rainfall and visitors (Don’t get me wrong, we love visitors. It just that they take away from our building time ;)), we finally finished the outside of our tiny house! We could not be happier with the outcome of our efforts. Choosing cedar wood was a good choice. The weatherboards came at a price but I reckon they’re worth it. Not only is cedar wood very lightweight, but it also looks and smells amazing and it’s easy to handle. The boards were fairly easy to install due to their softness. I say fairly because it was quite difficult the higher we got but we found a solution for this too. 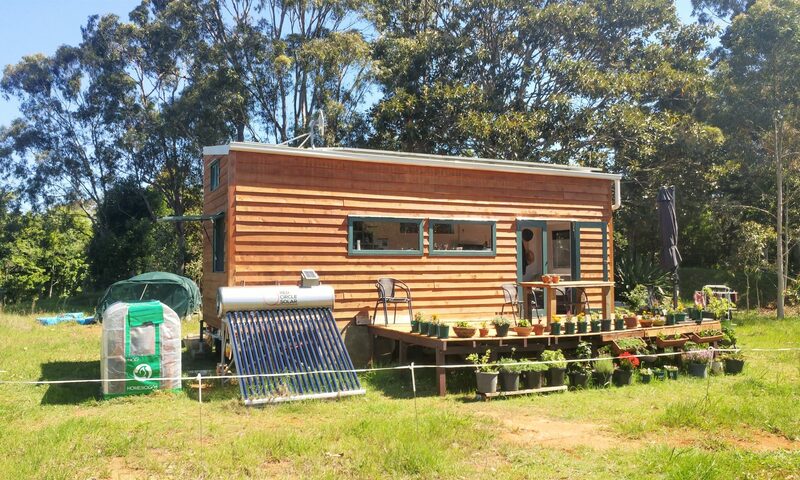 We even went into a little bit of effort at the front of the house were the cedar weatherboards meet the corrugated roof metal sheets. In order to make the outside look cleaner, we cut out the “waves” of the roofing sheets. That way the spot where the weatherboards meet the metal looks seamless. There’s not a lot we would do differently had we to do it all over again. Only a couple of things come to mind and that’s cost and calculation. As I mentioned before, cedar weatherboards are not the cheapest option when it comes to exterior siding. But cedar wood is by far the lightest and as we all know weight is a big issue when building a tiny house on wheels. Of course, there are a lot of ways to clad the outside of your tiny house. A mix of corrugated iron and wooden weatherboards or reclaimed timber to name a couple. Both options will keep costs down. But especially using reclaimed timber might be more difficult to handle and time-consuming. I would have loved to use more salvaged timber but does take a while to find what you’re after. At the end of the day, it’s really up to you. Each tiny house builder has to decide for him/herself what criteria are important and what look they want to aim for. So, long story short, we considered all the options above. But after doing our research we came to the conclusion that buying new cedar weatherboards is the best, easiest and fastest solution for us. Although I might go with the corrugated iron cedar mix next time. When ordering your weatherboards be sure that you’ve calculated beforehand how much you need. Sounds like a no-brainer, I know. However, when screwing on the weatherboards you will have to decide on the distance between the boards (that is if you’re using overlapping weatherboards as we did). The distance determines how many rows of weatherboards you will need to cover the full heights of your house. You don’t want to run out of weatherboards just to be left with a tiny strip of the exterior to cover. This happened to us, unfortunately. We chose a distance of around 2 cm but didn’t check if we have enough boards to cover the full height of our house. In the end, we had to buy another two boards to cover a small strip between the last row of boards and the roof in the front. Also, your weatherboards will come in different lengths. To get the most coverage out of your weatherboards and to avoid wastage be sure to calculate beforehand which combination of weatherboards is the best to cover each side of your house. So I recommend doing a little bit of math before screwing the boards on. This whole pre-planning might sound boring and time-consuming but it will save you time and money in the long run. Previous PostPrevious The cedar siding for our tiny house on wheels is going up!